What Is This? Who Used It? 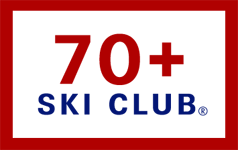 Why Is It A Rare Artifact Of Ski History? Thanks to the Colorado Snowsports Museum for this photo from its collection. This is Betty Welch Whitney, born in Haverhill, MA, graduated from Smith College in 1923, and first went on a ski trip with the AMC in 1928. 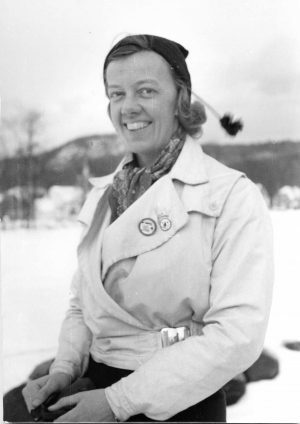 She remained an AMC member for life, and became a ski fashion and equipment buyer for Filene’s in 1936. With her husband H.H. “Bill” Whitney, she purchased the Moody Farm in Jackson, NH and with him operated Whitneys’ as the first ski area to combine food, lodging and a ski hill serviced by a tow. They improved the existing the rope tow lift a year later by attaching 72 shovel handles to the cable, making it easier for skiers to hold on. The lift was henceforth known as the Shovel Handle, and it helped make Whitneys’ one of the more popular early ski areas in New England. Whitney’s Inn is still in business and offers a traditional New England get-away experience with four-season activities. Thanks to the New England Ski Museum, now with locations in Franconia and North Conway, NH, for offering this photo for our Mystery Glimpse series. Here’s the Shovel Handle pub at the current Whitney Inn, Jackson, NH. 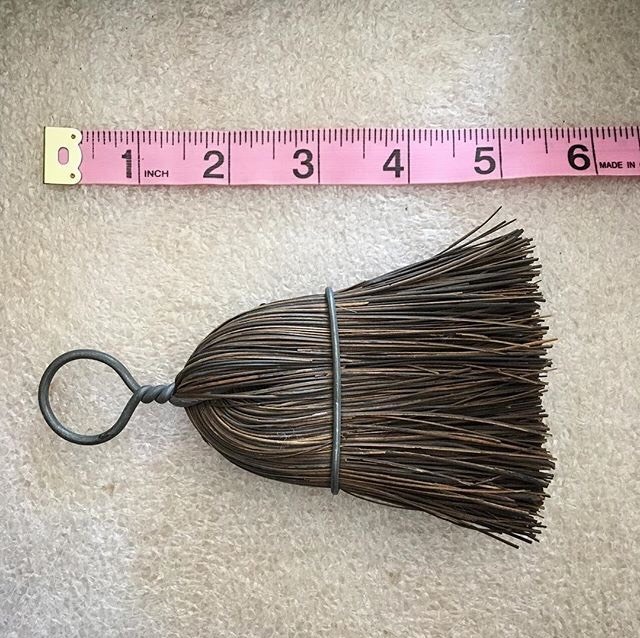 I don’t know about the little whisk broom but I can add a bit about the shovel handles. Bill Whitney was the first to turn the bull wheel horizontal and suspended the shovel handles overhead. The number I heard was 96. He ordered them from the Sears catalog and the folks there thought they were for some kind of WPA project during the depression. I believe there is at least one of the handles on display in the Shovel Handle Lounge in the Inn. Just a guess. The bristles look fairly stiff. 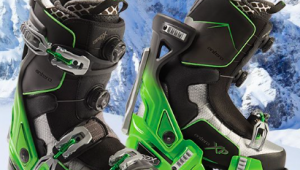 The little broom was used to wisk snow off the bottom of ski boots?